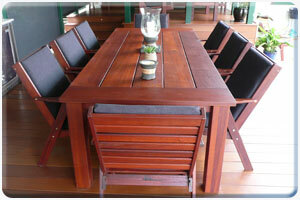 At Lifestyle Jarrah we are passionate in producing top quality handmade affordable Jarrah and hardwood timber furniture. 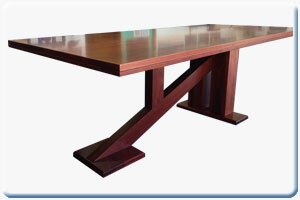 All our furniture is hand made to order in Joondalup, WA. Personal service and custom orders are our speciality and although we work predominantly with Jarrah we do manufacture furniture and settings from other timbers.Australian Wormy Chestnut from Victoria, American White Oak, Tassie Oak and Marri give a lighter colour pallet. Request a custom order and have your furnture made just for you. We also offer a unique DIY service - Design It Yourself - We are happy to advise and to do the hard work making your personal designs. At LSJ we believe we are a little different- not only do we make quality handmade timber outdoor and custom indoor furniture but we try to provide great customer service to make your dealings with us a good experience. We aim to make your solid timber outdoor and indoor furniture exactly the way your want it, to suit your home and your lifestyle. We understand that every family and every home is unique and we all have different ideas and needs so we are happy to design and build your outdoor, patio or indoor furniture to your specs. Every piece of outdoor furniture or indoor furniture we make is made for the customer who ordered it to their taste and style. Outdoor pieces are often finished off with outdoor cushions covered in a range of durable outdoor fabrics with a wide spectrum of colours and patterns. Whether you are looking for outdoor timber furniture, wooden garden furniture, patio furniture or a special piece of indoor timber furniture we encourage you to browse our website to see examples of furniture we have made. You are also welcome to visit our workshop, see our display of sample pieces, see how we make furniture and discuss your ideas with us. We also make strong, durable, heavy duty Jarrah Outdoor furniture for commercial use on mine sites, camps, caravan parks, hotels and cafes. 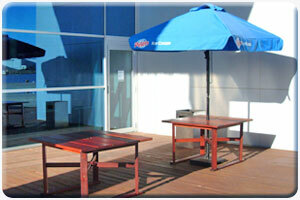 We have supplied outdoor Jarrah furniture and picnic sets to over 25 remote area mine sites in Western Australia. Our designs can be flat packed in semi knock down form for ease of transporting and quick assembly on site. Although we work predominantly in Western Australian Jarrah we have also made patio furniture in Australian Wormy Chestnut and Tassie Oak which give a lighter colour pallet for outdoor furniture which will be in more protected outdoor spaces. West Australian Marri is a popular choice for lighter coloured timber for indoor furniture, with amazing grain. Australian Wormy Chestnut and Tassie Oak come from the Eastern states and although not as hard as Jarrah are well suited to undercover but outdoor areas such as patios, pergolas and verandas.